Last week, I got invited to The Freckled Moose in Astoria, a restaurant that opened last July and whose name comes from a Northern saying: “In the contest of moose vs car, the moose will always win.” and was also one of the nicknames of the owner, Peter Lyman. I got to talk a bit with Peter who has an interesting background, growing up in Massachusetts and learning skills of a chef on the job. The menu is his creation, inspired by his childhood. I started off the meal with their signature cocktail: The Freckled Moose, made with Bacardi rum, crème de pamplemousse (grapefruit cream), pineapple juice and Shofenhoffer grapefruit. That was quite refreshing, fruity and a bit dangerous as you would drink it like milk. Then we got the appetizers that were, for the most part tasting portions. The first one is the nachos, a typical bar food that is a must have. Hard to believe that it was half a portion considering the amount we had on the plate! And it apparently is even bigger when you add beer pulled chicken to it! It was composed of tortilla chips, guacamole, onions, black beans, jalapeño, tomato and a blend of cheese. Then, the wings that were really food and had a nice kick. These wings are cooked 3 times: first they are smoked, then fried and finally finished on the grill. It was followed by the Mac and cheese, Peter’s personal recipe that is made with five cheeses: cheddar, mozzarella, fontina and gruyère, topped with Parmesan. Assembled to order, it was very creamy and of course the best part was the Parmesan crust on top! But the most interesting and decadent appetizer there is probably the crab tater tots that is the fusion of two classics inspired by Peter’s childhood in Nantucket where he was fishing (and eating) crab and tater tots. Served with a spicy remoulade, it was very good, a bit crunchy and tasty. Definitely addictive. For the entrees, Jodi went for their grilled cheese that is served with steak fries or tomato soup. She chose the latter. Grilled cheese and tomato soup is a very comforting dish and this was well executed. The sourdough bread was crispy, buttery but not greasy, and there was lots of cheese in it. On my side, I went for the volcano burger that is supposed to have a molten fontina cheese center. I say “supposed” because I was ready to see a melting center when cutting the burger in half, my phone set to the video setting, ready to immortalize that moment. Unfortunately, the magic did not happen. Nevertheless, it was a good burger, thick and juicy. It was served with steak fries that I did not really like because they were not cooked enough and not crispy. 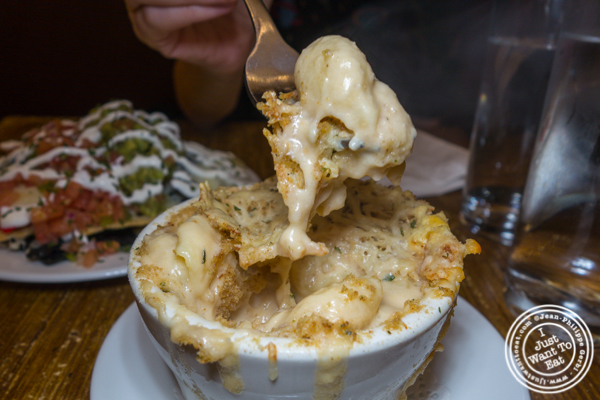 Overall the food at The Freckled Moose was good: this is the type of place you should know if you are in the neighborhood and want to have a drink or some comfort food in a relaxed atmosphere. And if you go, get these tater tots!